A rare, slow-motion outbreak of toxic E. coli sickened at least 250 people and killed one across the United Kingdom over a span of eight months this year before being traced to raw leeks and potatoes, the Health Protection Agency (HPA) recently announced. The HPA said it monitored the outbreak for six months as people continued to fall ill, but officials chose not to acknowledge the illnesses publicly because they had not identified a source. Months of inquiry have now led investigators to link the outbreak to people handling raw leeks and potatoes in their home kitchens. Authorities said the victims were sickened by a rare form of E. coli O157 known as Phage Type 8, or PT8. Of the 250 reported case patients, 74 were hospitalized, four of them with kidney failure attributed to hemolytic uremic syndrome (HUS), and one died. The outbreak is believed to have begun last December and continued into July. Cases were scattered across the UK, with 193 in England, 44 in Scotland and 14 in Wales. One hundred of the victims were children under age 16 and 69 percent were female. The HPA said interviews with victims eventually led them to root vegetables prepared in homes. 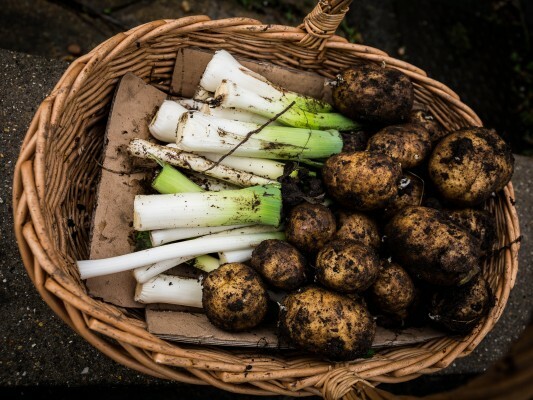 “Our study showed a statistically significant association with raw loose leeks and potatoes from sacks, but these vegetables may not be the only source of contamination, HPA gastrointestinal expert Dr. Bob Adak said in a formal agency statement. Most likely, it was the soil clinging to the vegetables that was contaminated with E. coli, Adak said. “In this outbreak, which is now over, the vegetables could have carried traces of contaminated soil,” he added. “It is possible people caught the infection from cross-contamination in storage, inadequate washing of loose vegetables, insufficient hand washing after handling the vegetables or by failing to thoroughly clean kitchen equipment, utensils or surfaces,” he said. Should the outbreak investigation have been better publicised? The HPA were criticised for their handling of the unpublicised eight month E.coli outbreak. The Fresh produce industry trade authority, the Fresh Produce Consortium (FPC), accused the HPA and FSA of having “complete disregard” for the industry through their lack of communication during and after the outbreak. He added that the HPA’s decision to make a public statement without sharing their findings, “smacks of having a complete disregard of any consequences on the industry and on consumer confidence.” “It’s vital that UK authorities liaise and share information with us much sooner, and that they understand more about industry processes as part of any thorough investigation before pointing the finger at certain sectors of the food industry. Instead we are being blamed without being given the opportunity to review the evidence on which this conclusion is based,” said Jenney. Following the outbreak, the Food Standards Agency (FSA) reminded consumers to follow good hygiene practices when storing and preparing vegetables.